Mulch, Mulch, and Mulch More! When sprucing up flower beds around their yard, many people use and lay mulch to improve and polish off the appearance their beds. What many people do not realize is that mulch is not only aesthetically pleasing but also provides many benefits for the plants and the beds themselves. A good layer of mulch around trees and in flower beds helps to moderate soil temperature, retain moisture in the soil, and suppresses weed growth which is valuable to the health of your plants. 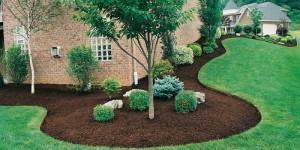 Call Streamline Landscaping NOW for FREE QUOTE for sprucing up your beds and applying a layer of mulch, 708-296-4081!! ← Recent Walkway Extension Project Complete!